A few weeks ago I had the most amazing Croque Monsieur for lunch. It was incredibly rich, and I savored every bite. I knew I had to make a version of it at home. I went for an open faced croque monsieur. It surprisingly easy and absolutely delicious. I used some large french rolls for the base of the sandwich. The béchamel sauce sounds super fancy and hard, but it is just a quick white sauce. The most expensive part of this recipe is the gruyere cheese. It was about $7 for 8 ounces at Publix. If you don't want to spend the money, you can substitute swiss cheese. I used gruyere and used the leftover cheese in some mac and cheese. Either way, these sandwiches are not to be missed! In a small pot, melt butter over medium heat. Stir in flour. Cook 1 minute, slowly whisk in milk. Continue stirring until sauce thickens, about 5 minutes. Stir in salt, pepper, and 1 cup of the gruyere cheese. Set aside. Slice rolls in half and spread butter over each half. In a medium skillet, grill each bun half, butter side down, until lightly brown. Spread honey mustard over each roll half. Place into lightly greased 9x13-inch baking dish. Top each bun half with 3 slices deli ham. Pour cheese sauce over top of all rolls and sprinkle with remaining gruyere cheese. Bake 10-15 minutes until hot and bubbly. I love Croque Monsieurs. This looks delicious. We made Croque Madame's last winter but our Monsieur phase wasn't in the same league with what you've made and I can see why you savored every bite - this is on my must try soon list. I have got to figure out a way to make these gluten-free. They look to die for! These look and sound fabulous!!! Love it being open faced. You sure can't beat a croque monsieur....so good!! Thanks for sharing your great recipe!! N.
Those are making my mouth drool. I prefer the croque madam (with egg) as one of my 3 favorite sandwiches EVER. throw eggs on top and u got croque madames! 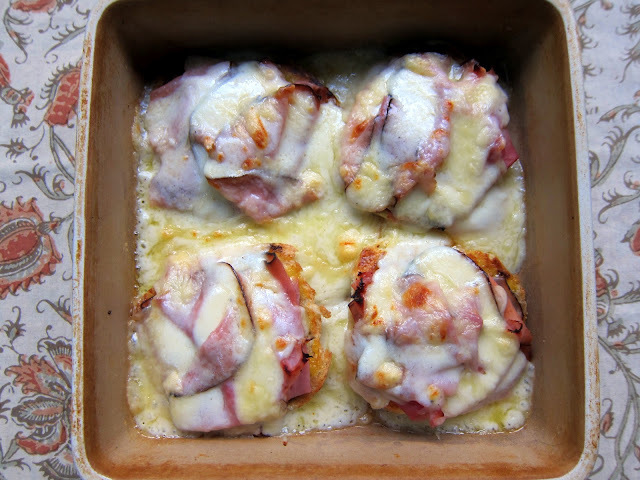 Your version of Croque Monsieur sounds fantastic!